(mainer) | i like parentheses. Oh, hi there. I haven’t posted in a million years. Sorry ’bout that, I’ve been … well, not busy. Distracted. And I’ve actually got FOs! But we’ll get to those in a few days, mkay? In the meantime, drop what you’re doing and go read this. Intellectual property rights are under attack all over the Internet and almost no one is paying attention. Well, as knitters and designers and bloggers and consumers, we should be paying attention. We should care about this – because no one will design awesome free patterns if they’re treated as if their work has no value. So go, read, spread the word, and let’s start a ruckus. Let’s make people pay attention, and let’s show that theft of intellectual property is just as bad as stealing my iPod or your car. 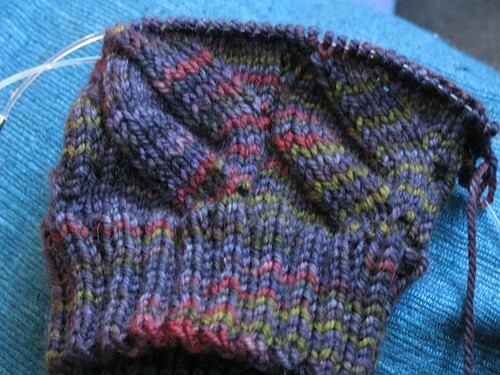 I haven’t been blogging too much lately – got caught up on Ravelry, Flickr, Twitter, the rest of the internet. A lot has been happening – the holidays, looking for a new job, and regime change here in Washington. And as the subject says, I was there. A few weeks ago, I signed up to volunteer for Inauguration Day. I knew I wasn’t going to be working, so I figured I might as well get involved and be part of history. So, two days ago, I got up at 4 a.m., put on as many layers as I could manage (two pairs of socks, long underwear, jeans, a wool sweater, a scarf, a cowl, two pairs of gloves, two hats, and a wool coat), got on the Metro and headed to the National Mall. I expected to be on a deserted train – instead, I couldn’t even get a seat. By the time I got to the Mall, people were streaming onto the grounds, heading towards the Capitol. I met up with my volunteer team, amidst the thousands of other “red cap” volunteers scattered around Mall. The atmosphere all over the Mall was electric. 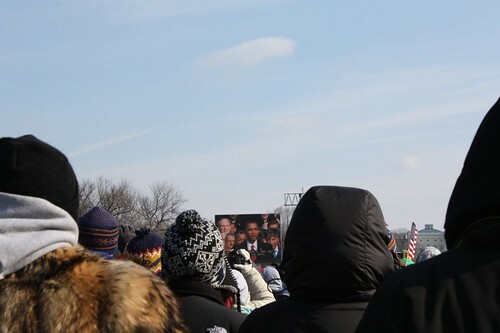 People had come from all over, all bundled up and prepared to wait HOURS just to see Obama sworn in on a Jumbotron a mile from the Capitol. There were crowds and lines and more than a little confusion, but people were just so excited that it didn’t seem to matter. Our fingers and toes were freezing, our ears were numb, but it was a privilege to be there, to be a part of that historic day. Two hours after I got to the Mall, the sun finally started to rise – it was going to be a gorgeous, clear day, if cold. Around 8 a.m., the Jumbotrons flared to life, showing the We Are One concert from a few days earlier. The crowd got really excited and sang along and danced to keep warm. While eating my lunch at 8:30 a.m. with my fellow red caps, we listened to Mary J. Blige and Bruce Springsteen and U2 and James Taylor. When Garth Brooks came on singing “Bye bye, Miss American Pie,” the entire crowd sang along. 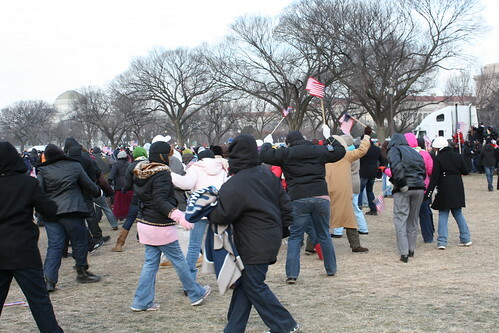 Groups of people in puffy parkas spontaneously started dancing – the Electric Slide was very popular. When “Shout” came on, the whole crowd went nuts, dancing and singing and shouting along. It was so much fun (and a great way to warm ourselves up)! 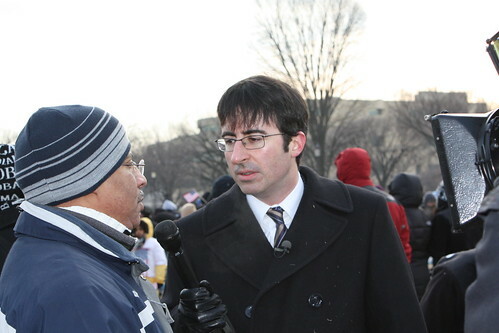 A few of my fellow volunteers and I also crossed paths with celebrities, including the Daily Show’s John Oliver, who was in the crowd interviewing people. When the concert was over, the Jumbotrons showed people arriving at the Capitol for the ceremony, and the whole crowd cheered as people like Ted Kennedy, Al Gore and Puff Daddy were shown. The biggest cheers, of course, were reserved for Obama’s arrival, taking the oath and his speech. It was an incredible day. At times, I couldn’t believe it was really happening, that we as a country had really made such an intelligent, brave, progressive choice. I was overwhelmed by the emotion, not only my own but that of everyone around me on the Mall. 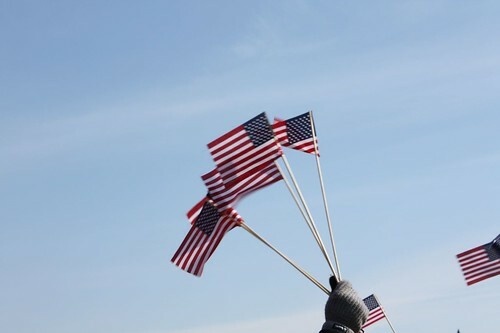 People were crying, screaming, cheering, kissing, hugging, and waving flags with all their might. Two days later, I still feel incredibly hopeful and excited for what’s to come. Things aren’t great right now, but I believe that we have chosen the best, most intelligent, most compassionate, most thoughtful person to lead us back in the right direction. 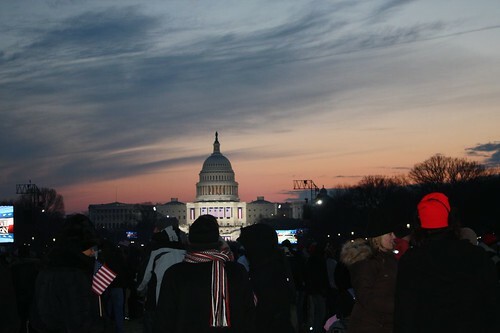 I will always be glad that I stood in the cold for 8 hours to see him raise his hand and take the oath of office, that I was there on his first day. Oof, well, it’s been a while, eh? That’s what happens when you work on the election. And what an election! I’m extraordinarily happy with the outcome and still so emotionally invested that reading articles can make me weepy. I’m proud and happy to say I played a role, and the state I worked the most in turned blue! I’m still recovering (and by recovering, I mean the cold that held off until Election Day has hit and I’m firmly ensconced on my couch), but I’m also celebrating. And you know how we knitters like to celebrate, don’t you? Oh, yes, there will be yarn. Yesterday, a Rav pal and I went to Stitches East in Baltimore to hit the market. What a place! It was a lot of fun, although somewhat overwhelming. I busted my budget a bit, and now I’m being taunted by all the delicious new yarn currently sitting on my living room chair. Want to see what I got? 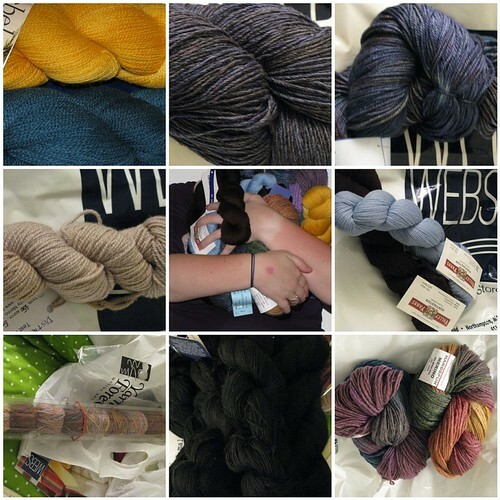 Top row: a yarn called Jezebel in two colors for colorwork – possibly a Joni hat or some mitts; Brooks Farm Yarns Mas Acero – a gorgeous wool, silk and viscose mix that I’m planning a Woodland shawl for; and a beautiful merino/cashmere sock yarn from Creatively Dyed yarns. Middle row: a test skein of a new Malabrigo yarn, Dos, a two-ply – I’m thinking a hat, possibly; two skeins of Valley Yarns Huntington, from WEBS, for more colorwork. Bottom row: one of the cooler things I found, a set of ten mini-balls of yarn for a lengthwise garter scarf; five skeins of Malabrigo Lace for a sweater (I know, I might be crazy), and two skeins of a very soft, unbranded wool that I’m thinking about using for some Christmas gift hats. It was a great day, and I could have easily come home with much much more. I didn’t get my hands on any Malabrigo Sock, because it was pretty picked over, color-wise, but I did meet the owners of Malabrigo, who are the nicest, most genuine guys! I also ogled a lot of lovely shawls, and I think some serious lace is in my near future. Up next, though, is a finish-a-thon. I’ve got a baby blanket, a pair of socks, a hat and another baby gift that I need to crank through before I can really start anything new. I might have to prioritize the hat – I’m going to need it. Turns out, I’m going to Minnesota for work in a week or so, and it’s awfully cold there. Anyone know any good yarn stores in the Twin Cities I should check out? I’m not normally a superstitious person – even though I’m a Red Sox fan. During the regular season, I can ignore little weird superstitions (unless they work for me, like the positive correlation between the Red Sox scoring and me eating chocolate ice cream) and most losses don’t really bother me – there’s always another game to play, to make it back up. All that changes when October baseball rolls around. I become a superstitious freakshow, wearing the same t-shirt over and over again (this year it’s a 2007 World Series champs shirt), desperately scrubbing dishes to drum up good energy, and knitting obsessively on the same project (a sock, it must be a sock). Two games into the post-season, the Sox are up 2-0 and my good mojo socks are seeing some excellent progress. Yarn: Woolarina sock in what I’m told is a “Kate” colorway – I picked this up last weekend at Crafty Bastards, a local craft fair. Mods: I started out with 80 stitches, so I could make taller socks. 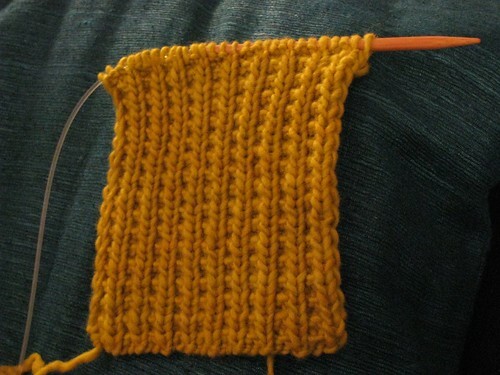 After a pattern repeat, I decreased down to 64 stitches over the course of the second pattern repeat. I’m loving this pattern – it’s perfect for watching baseball. After the first row of the repeat, I had it memorized, it’s really simple but looks great. It works nicely with this yarn, too, which is variegated but sort of tonal. Loving it – and hey, it’s got two Red Sox post-season wins knit into it, too! I was born in Maine. I grew up in Maine. I went to college and grad school in New England, but now I live in DC and there are adjustments that have to be made. Expectations have to be … altered. You see, New England has four seasons – and DC has three, really. Spring in DC is gorgeous. Winter in DC is bearable. Summer in DC is murderous. But Fall, my favorite season? It’s pretty much nonexistent. If it does show up, it’s usually only for a week or a handful of days, or we fake it and pick apples in 80-degree heat. But that’s okay – because I’m prepared. 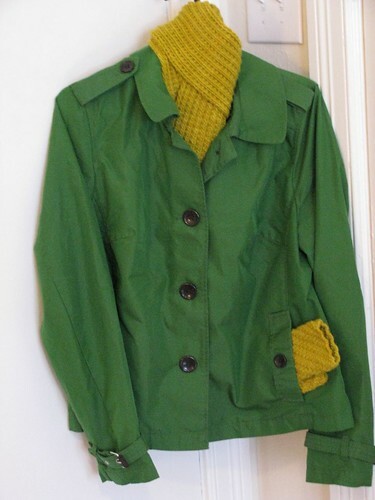 When those few days of perfect fall weather arrive, I will be ready. Scrunchable Scarf: took a full skein plus perhaps a quarter of the second. 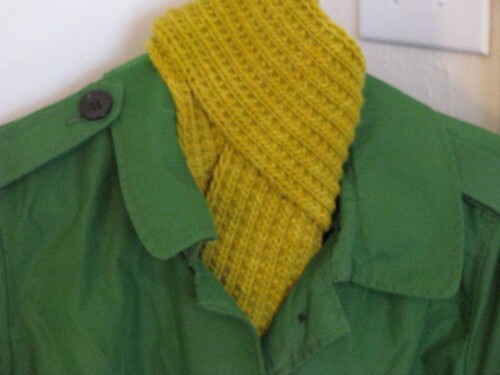 I knit it over 38 stitches, on size 8 needles, to a length of roughly 62″ (my height). 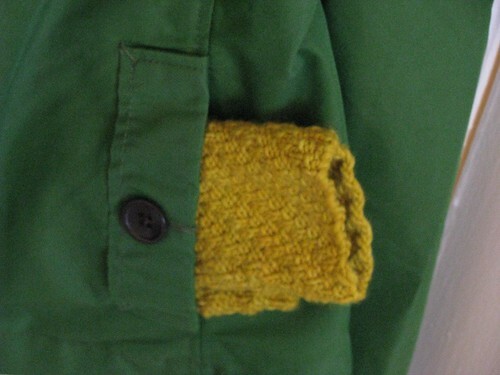 I highly recommend this pattern – easy, quick, satisfying, and a perfect match for this yarn. Juniper Mitts: I knit the smallest size, 40 stitches, and added an extra repeat both before the thumb and after the thumb for a little additional length. I’d estimate this pattern used half a skein of yarn, perhaps less. I bound off using my normal bindoff (ignoring the pattern, of course), using a size 9 needle – I knit these on size 6s. Great pattern – very easy, very fast and very cute. I did not embellish with a button, although I may add one. So bring it on, Fall! I’m ready! I love yarn. I’m a yarn collector. One of my favorite things to do is wind yarn. 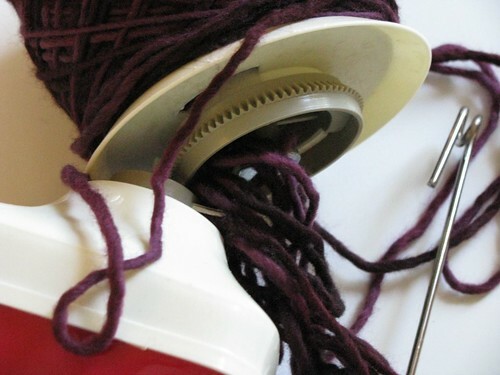 Ever since I got a swift and a ballwinder, I’ve enjoyed the sensory experience of winding yarn – feeling the yarn slide through my fingers, watching the colors change, watching the spinning swift and cranking the ballwinder, finding a rhythm as it curls my yarn up into a satisfyingly hefty little cake. I like to sit at my kitchen table and wind up my skeins, pondering what they will become – a cowl? A baby sweater? A pair of socks? Usually winding is calming, a quiet, thoughtful process. But some days … some days, winding is an unmitigated disaster. Today I had to actually cut the yarn in order to untangle it. Sigh. Must remember to keep a closer eye on that ballwinder. Or maybe invest in this. Knitting – a lot. Apres Surf Hoodie. Baby Sweater. Ravelympic skirt that has been back-burnered because 397 stitches a row is torture. A scarf. 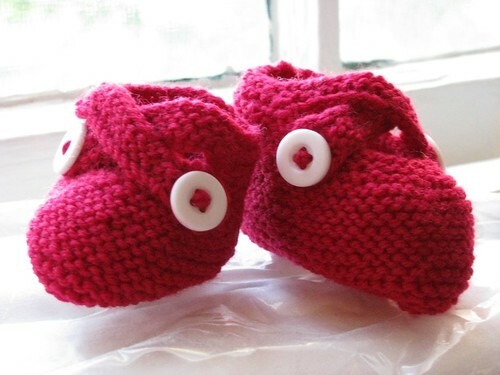 A pair of baby booties. A sock. 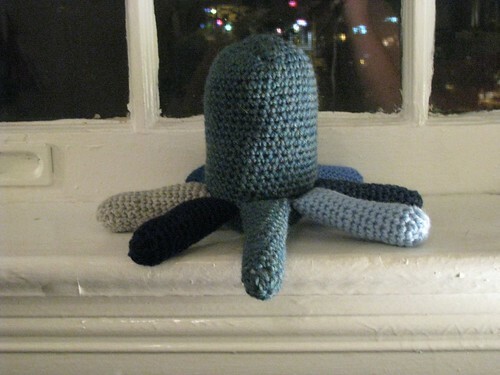 Crocheting – I learned how to crochet in a circle and made an amigurumi Octopus! His name is Augie. He doesn’t have eyes yet, but he will. *headbutt* That’s Sam, the cat I took care of for a week, during which I introduced him to Battlestar Galactica, my new obsession, and he introduced me to working on two hours of sleep. Not really a fair trade off. Buy stock in Tylenol PM if I ever decide to pet-sit in a studio apartment again. Thankfully, his owners just picked him up, so I’m going to go watch another disc of BSG and knit – without a cat on my lap! 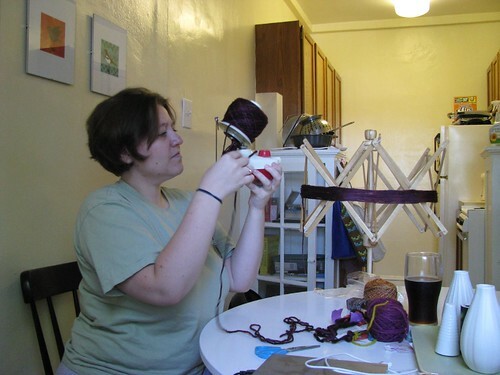 One thing I’ve learned from Ravelry, if I didn’t know if before, is that I am completely and totally impressionable. I’m distracted by shiny things, and Ravelry is just so very full of shiny things. My favorite feature, other than my beloved groups, is the activity function. It lets me see what my friends have faved and queued and stashed and started and finished. I love the viral nature of it – clearly I’m not the only one who’s impressionable. I watch certain patterns and projects pop up over and over again. Sometimes I “discover” something and watch with glee as it makes its way through my friends’ list. I love it so much I keep my friends’ activity in my Google Reader in an RSS feed. This impressionability usually shows itself in my queue, which currently stands at 416 projects, and my favorites, which holds 268 projects. They both grow constantly as I discover fantastic new patterns and projects. But sometimes, the impact on my needles is more immediate. A week or so ago, I spotted a project, faved it, then turned to my WIP basket, pulled out a scarf I’d started a few weeks earlier and immediately frogged it and cast on for a Scrunchable Scarf (rav link) instead. there used to be a blog at kniterati.org. i killed it – or rather, i seriously injured it, accidentally, and decided maybe it was time to let it die. so here i am, starting over, on 7/11. this one is very much a work in progress, so bear with me. and while i get my bearings here, take a look at one of my favorite places in the world, the balcony at the Uptown, the old-fashioned movie theater in my neighborhood.